The Bushwick Block Party is only one of the exciting things happening this weekend. 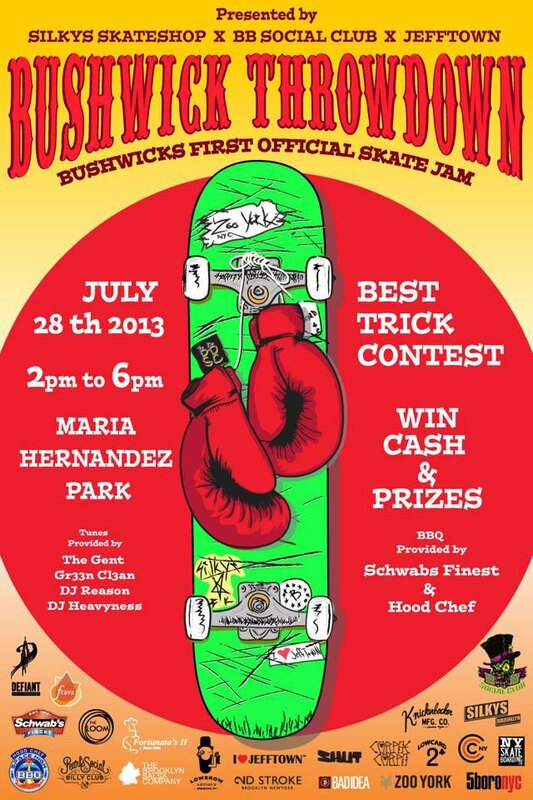 This Sunday, July 28th, Silky's is partnering with Jefftown and BB Social Club to bring to you the first ever Bushwick Throwdown - Bushwick's First Official Skate Jam. From 2 to 6PM at Maria Hernandez Park, skateboarders will compete in a best trick contest to win cash and prizes. Contestants will also undergo a series of skateboarding games on custom ramps and will be judged by professional skaters from BB Social. And it doesn't end there - there will be plenty of music, and BBQ provided by Schwabs Finest and Hood Chef. If you are an avid skater, or just simply have a deep appreciation for it, it is sure to be one fun afternoon!